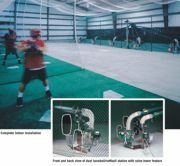 Whether you're considering an indoor or outdoor commercial batting cage, the technologically advanced systems from ATEC® can meet your needs. With more than 40 years of service to the industry and hundreds of systems globally, ATEC® engineers have designed to the most demanding of operational requirements. Ask the experts who equip the Major League and many of the leading university programs in the country. The heart of the ATEC® system is the Casey® pitching machine, the Official On-field Pitching Machine of Major League Baseball. ATEC® offers performance, reliability, service and state-of-the-art designs. ATEC-Athletic Training Equipment Company: 800-775-2832. The ever-increasing popularity of skateboarding has created the need to store and secure these devices once riders reach their destination. The Boardloch® brand skateboard security rack offers an effective solution by not only reducing your liability but also by placing the responsibility on the skateboarders to store and secure their own equipment. 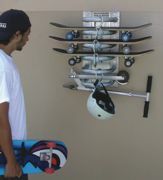 The security racks offer a safe, durable and cost-effective way to store and secure skateboards as well as most scooters when they need to be left unattended or are restricted from certain areas. 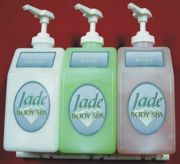 Jade Distribution offers a complete line of locker room amenities. You can find everything you need including dispensers and containers, combs, razors, body wash, shampoo, hair dryers, lotions and towels. Jade Distribution specializes in servicing the locker room amenity needs of large, upscale athletic clubs. The experts can show you how you can get body wash and shampoo for a low per-gallon price. You also can have your logo printed in full color on all dispensers and retail lines free of charge. DuMor's Bench 165 is one of the new additions to its full line of products that quickly has caught the attention of many clients. The sleek, new, cast-iron end supports with flared armrest, combined with the soft look of wood slats, make this an effective bench for almost any setting. Shown with Ipe slats, the 165 Bench also is available with redwood, Douglas fir or western red cedar. Gerber Manufacturing has been manufacturing picnic tables, park grills and park benches since 1969. One of its new innovations is the use of recycled plastic for the seats and tops of the picnic tables and benches. The recycled plastic is made from post-consumer bottle waste, resulting in a product that is more than 90 percent recycled. The color is molded throughout the entire plank. The Monster series of table frame is constructed from 2-3/8 OD schedule 40 pipe, and end frames are welded. The frame is available in either a painted finish or hot-dipped galvanized after fabrication. The Model MB adds a new, exciting tractor to the proven Walker Mower line. This clean design uses the same principles as the original Walker Mower, including tilt-up body, zero-turn maneuverability, low center of gravity and operator comfort in an even more compact configuration. It's simpler and more economical for non-catching applications by eliminating the provision for the built-in Grass Handling System used on other Walker Mowers. Two independent Hydro-Gear® transaxles are matched to Walker's innovative control system using a forward speed control and two steering levers to make an agile, easy-to-operate tractor with a ground speed up to 8 mph. Doty & Sons Concrete Products, Inc. has been manufacturing high-quality concrete products since 1948. The product line includes litter receptacles, cigarette urns and banks, benches, planters, bollards, table sets, and other products. Custom concrete products also are available. Finishes include exposed aggregate and sandblast finish. You also may choose special aggregates, such as granite, and colored concrete. Doty & Sons now offers a new style concrete bench called the Legacy Bench. The bench's classic design gives it a distinguished look. It's available in 5-foot, 6-foot, 12-foot and custom lengths and in Ipe lumber or recycled-plastic lumber. Centaur Floor Systems now offers XL Turf, an innovative artificial turf system developed through ground-breaking research to actually slow down the onset of muscle fatigue. XL Turf requires no sand or rubber in-fill, so the top layer of the surface remains soft, even and consistent through all kinds of play and weather conditions. Its patented layering system combined with its modular design have been proven in tests to last longer than conventional surfaces, maintaining its superior performance even after the equivalent of 10 years of wear and tear.